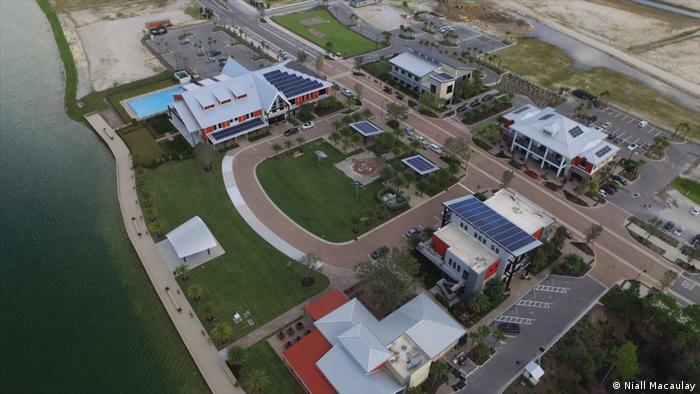 While the architecture looks similar to elsewhere in Florida, the town’s homes — built to Florida Green Building Coalition standards — are high-tech and eco-friendly. The roofs are metal to reduce heating and cooling costs and have extended eaves to create shade. The garages have charging facilities and the gardens are only 30 percent lawn, leaving the rest for less thirsty native plants. “Gray water” reclaimed from the town’s on-site treatment plant and rainwater runoff — the streets have no drains or curbs — is used for irrigation and to top up lakes. This mix of modern and traditional is partly what cemented Richard and Robin Kinley’s decision to move to the new town, located just northeast of the sprawling gated communities, golf courses and strip malls of bustling Fort Myers. “I kind of like it a little slower paced now,” she told DW. The Kinleys were among the first residents to move to Babcock Ranch in January 2018. The town is being built in stages and as the weeks pass, the street is taking shape around the Kinley’s residence as more houses go up. 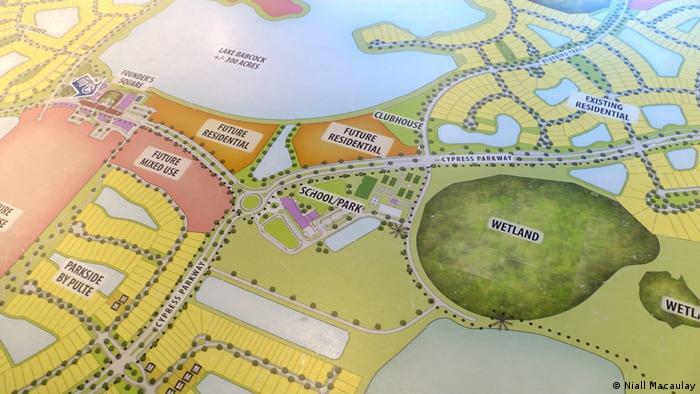 The 18,000-acre site (about 7,200 hectares) should eventually house 50,000 people in 19,500 homes. “We wanted Babcock Ranch to be the first solar-powered town in the United States, maybe the world,” said Kitson, a towering former National Football League (NFL) guard. So Kitson purchased a 91,000-acre ranch in the Sunshine State. And in Florida’s largest ever environmental real estate deal, he sold 73,000 acres to the state, which has designated the land as a nature reserve. Still, it wasn’t plain sailing. “What we didn’t realize, this was back eight or nine years ago, is how difficult that would actually be, to convince people that it’s the right thing to do,” recalled Kitson. Kitson’s solution was to donate 440 acres of ranch land to Florida Power & Light (FPL), a utility company with over 10 million customers. The deal means the town runs on energy from the power company’s solar farm, so residents don’t have to pay up front costs for switching to the renewable energy source. They will, however, have to continue paying standard rates for their electricity. Even if his formula isn’t cutting edge from a global perspective, for Kitson it made sense to partner with a power company with deep pockets in order to strike the right note with American buyers. “When most people think of Florida, they think retirees. 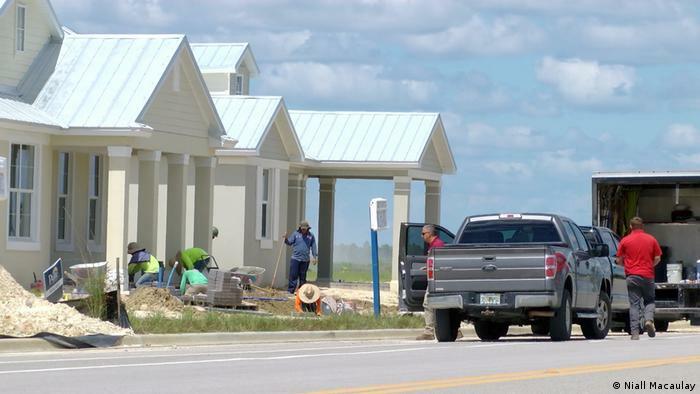 They say, ‘wow, that is a great place to go and retire.’ Well, guess what, there are a lot of young people living here too,” Kitson said. To get the right mix of ages, the developers have created recreational facilities with swimming pools, nature trails and lakes for fishing and boating. They’ve also got exercise machines that generate power when they’re used. The neighborhood school offers an environmentally focused educational program they call “greenSTEAM” that integrates science, technology, engineering, the arts and mathematics. 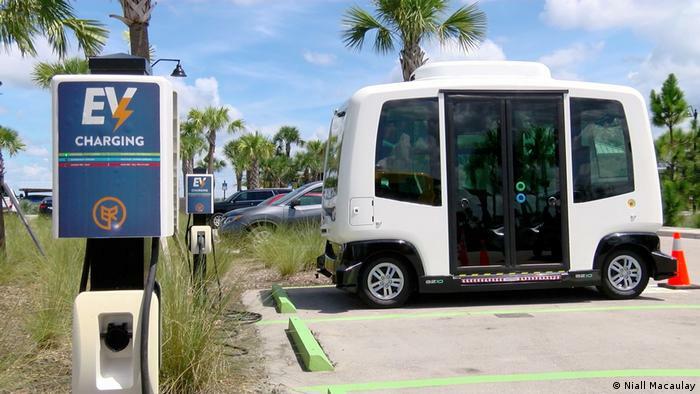 Residents can also use an app to arrange local transport in autonomous vehicles and electric buses will soon transport students to the town’s schools. For those already living in Babcock Ranch, like Richard Kinley, it’s a way to take some responsibility for the environment.